Welcome to A Million More Pages. We are a challenge-based reading group that runs seasonal challenges centered around themes. 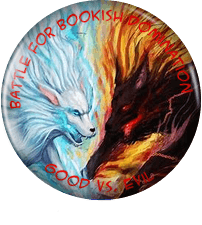 Join us February 1, 2019 through May 31, 2019 for an epic battle between good and evil. Turmoil has engulfed the Book Republic. In a period of intense civil war, Superman, Luke Skywalker, and Iron Man team up and battle the evil forces of Khan, Magneto, and Voldemort. Each side is armed with their choice of the best books (and some of the worst). Innocent civilians like Aunt May, Vicki Vale, and Tara Maclay have been caught in the crossfire, trying to go about their reading lives. In a last ditch effort to end the war with minimal bloodshed, reading challenges have been created. Lines have been drawn. Whose side will you be on? By participating in challenges you earn Badges. They are just for fun but many people like to collect their badges as a way to display their reading accomplishments. You can participate in as many or as few challenges as you like...it's all for fun. 1. Must be 18 yrs of age to join. [close] 1. Must be 18 yrs of age to join. 2. All challenges and games belong to AMMP/AMMP Game Night. Please do not re-create our challenges in any other groups without our permission! 3. Regarding Badges & Trading Cards: We would appreciate it if you do not duplicate this idea/creation in any other groups. If you would like to borrow the idea, PLEASE ask permission and give us intellectual credit. This is a unique feature to AMMP. Too Good to be Evil, Too Evil to be Good! Join the Dark Side. We have cookies! Mad about Science in the name of Evil!